Freshdesk is a very popular and effective help desk solution chosen by many international companies and small businesses. It offers a flexible pricing plan with a wide range of features to choose from depending on your individual needs. In this article we’ll discuss all pricing details of Freshdesk and we’ll compare it to pricing plans of five other popular help desk solutions available on the market to give you a perspective and answer to the question how much does Freshdesk cost. After reviewing all major help desk solutions our team of B2B experts found Freshdesk to be the best product currently available on the market. Freshdesk is currently a leader on our best help desk solutions ranking list. The app’s score is also supported by a very high customer satisfaction rating of 98% which shows how well-received the software is by its actual users. 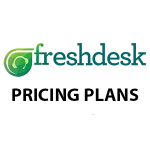 Freshdesk offers flexible pricing plans and also has a free version available to small teams of up to 3 agents. You can try out their key features with a great free trial plan as well to check if the app will meet the requirements of your company. You can easily sign up for Freshdesk free trial here. 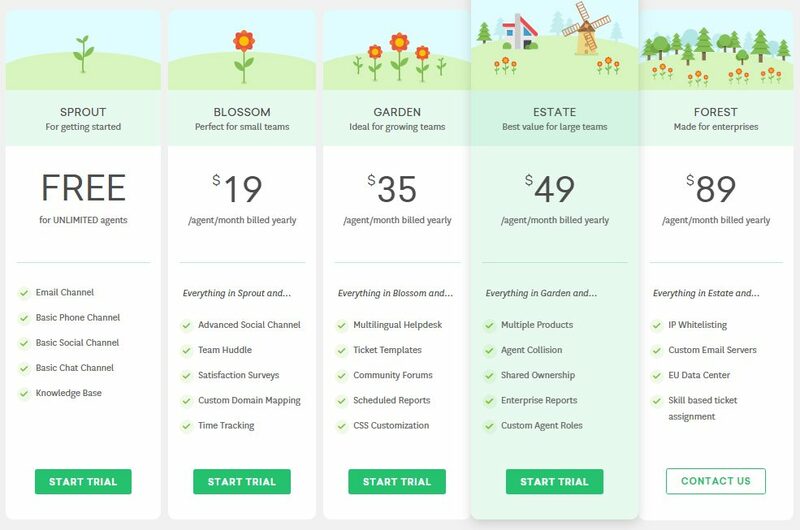 Freshdesk offers 5 pricing plans and a great free trial that allows you to test all key features of the software before you decide if its the right fit for your company. You can also consult Freshdesk pricing info here. If you’re unsure which package will work best for your company we recommend that you try a free trial first to test all the key features and find out which ones are actually useful for your help desk team. You can easily get Freshdesk free trial here. If you’d like to get more information about Freshdesk features, pricing and available integrations you can read our Freshdesk reviews. One of potential alternatives for Freshdesk is a help desk software called HappyFox. While being a definitely solid software deserving its place in our top 10 list HappyFox is not as great as Freshdesk and the pricing plans offered are slightly more expensive. You can also save up to 25% on annual payment. If you’d like to get more information about features, customer support and available integrations for the app you can read our detailedomplete review of HappyFox. Another alternative to Freshdesk is Samanage Service Desk. Its pricing is far more expensive compared to Freshdesk plans. Samanage Service Desk is a cloud hosted help desk and asset management product offered on monthly subscription. You can choose between Asset Management or Service Management, or a combination of both. Pricing starts at $250/month. You can get more information about this software and its features and pricing from our detailed review of Samanage Service Desk. You can find more information about features, integrations and customer support in our detailed review of Work[etc]. Another competitor of Freshdesk is an app called Zendesk. While offering comparable pricing plans Zendesk does not have a free plan for small teams like Freshdesk which may be a deal breaker for smaller companies. You can find more information about features, pricing and integrations available for the app in our detailed review of Zendesk or you can read our comparison of Freshdesk vs Zendesk. Our experts have given Desk.com a high rating which earns it a spot in our ranking of best help desk solutions. Desk.com offers three plans plus a free trial of the Standard Plan. You can upgrade/downgrade at any time, but your prepaid plan cannot be credited or refunded in case of a downgrade. You can pay monthly or annually. Visa, Amex, and MasterCard are accepted. All the features of the Standard Plan for 14 days. After the trial, select a plan and you will be billed accordingly. Up to 3 users with basic functions for multi-channel support, case management, reporting, self-help, integration, and security to get your customer service started. Ideal for an SME with growing business. Supports unlimited email inbox, Twitter, and Facebook accounts. Fully featured case management including custom fields, case routing, and agent achievements. Support includes knowledge base plus customer support center in English only. Full customization and integration functions. Includes Standard Plan features plus: unlimited data access in reporting; self-help available in 50+ languages and for multiple brands; annual invoicing; beta program access; and sandbox option for testing configuration changes. For larger organizations Desk.com can be customized to fit their needs. You can get a more thorough analysis of Desk.com and its features and capabilites from our detailed review of Desk.com. With an impressive score and user satisfaction rating, Freshdesk is definitely the best help desk solution available on the market today. It’s also inexpensive as it offers flexible pricing plans that can be adjusted to the specific needs of your company. One of the highlights is also the completely free plan for small teams of up to 3 agents that allows small companies to use Freshdesk at no cost. You can also easily try out Freshdesk on your own with a great free trial plan and test all its key features for 21 days. You can sign up for Freshdesk free trial here.